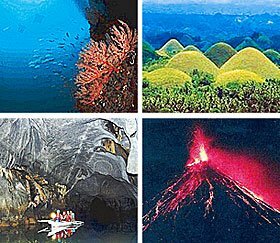 Wow Philippines - The World Of Wonders Will Dazzle You! WOW Philippines is the flagship tourism program of the department of tourism to ensure that the country’s key tourist destinations are well advertised. The Philippine government has been very aggressive in promoting the different tourist spots in the country through the "Wow Philippines" campaign. A country blessed with an extensive coastline, the Philippines is ringed with unspoiled beaches and first-class resort facilities. Endowed with a temperate climate, the Philippines offers a perfect treat to enjoy the sunlight. Lying in southeast Asia and surrounded by the Pacific Ocean, the Philippines boasts of unsullied beaches, spectacular sunsets, luxuriant pastoral lands, cool mountain weather, brilliant man-made resorts and dazzling islands, enough to make your day “wow” enough. The generous and welcoming treatment of Filipino people to their guests or visitors is a trait displayed by every Filipino. Seldom can you find such hospitable people who enjoy the company of visitors – local or foreign. This is one of the reasons why the Philippines is still one of the top places to visit when planning to spend a holiday with family and friends. This country is considered by many tourists as a pleasure-seekers' paradise, a perfect destination for entertainment and night life. For tourists wanting to have a long and exciting trip abroad, English spoken in the Philippines is one factor that will make your stay more convenient. The Philippines is currently the third-largest English speaking country in the world. The American occupation was responsible for teaching the Filipino people the English language. Sea and air transport are the most popular means of transportation getting to other parts of the country. The Philippines has its airports and seaports situated throughout the country. The Philippine government is currently spending more to improve Philippine infrastructure to boost not only tourism, but also trade and commerce. Home to colourful fiestas, Chocolate Hills, white-sand beaches, dolphin watching and tarsier monkeys. One of the most important and celebrated places of battle in the Pacific Theater during World War 2. Perfect weekend retreat, a wonderful ambiance to unwind and enjoy the beauty of nature. The way of life is more about farming and fishing, and it is basically all about provincial living. If you haven’t been to the Philippines. now is the best time to go. The pristine beaches, the exciting nightlife, the rich wild and marine life, the shopping bargains and the friendly people will surely make your stay worthwhile, unforgettable and a "Wow Philippines" experience.